The OM-AIR series has been discontinued. Please contact our Flow Engineering department for a viable replacement. OM-AIR Pneumatic push to connect Air Line Fittings are design with a releasable stainless steel grab-ring to grip nylon or polyurethane air line tubing (85 or 95 durometer). 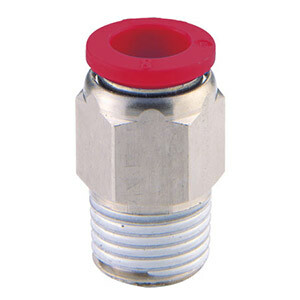 Release buttons allow for quick assembly and release, a true Push-to-Connect design.The brass components are nickel plated and pre-applied sealant is used on all tapered threads and recessed captive o-rings on all parallel threads. Internal and external hexagons are standard on all straight fittings. Union fittings come with mounting holes. Air Line Fittings are available in multiple thread and tubing selections: Standard to Standard : Metric to Standard ; and Metric to Metric to help you connect all your pneumatic motion devices. Standard Sizes: 1/8, 5/32, 1/4 and 3/8"